Life Itself: Richard Linklater's journey through "Boyhood"
There is perhaps no better example of the motion picture as an act of faith than Richard Linklater’s Boyhood. The best-reviewed film of 2014 thus far, it was shot in a little over a month of days spread over a time span of 12 years, with the same actors playing the same roles, aging as their characters aged, changing as their characters changed. What could possibly have gone wrong, other than everything? Because it is impossible to address “Boyhood” without first explaining how it was made suggests that this close-to-three-hour drama is all about the gimmick. It’s not. Watching the principal boy in the ’hood, Mason (Ellar Coltrane) progress from kindergartner to college, clumsily negotiating the obstacle course of modern American childhood, is an exhilarating, melancholic and spiritually uplifting thing. Linklater, through music, décor and attitudes, creates a kind of time trip that cinema never has undertaken before—a movie cannot be a “period piece” if it is shot during the period it covers, can it? 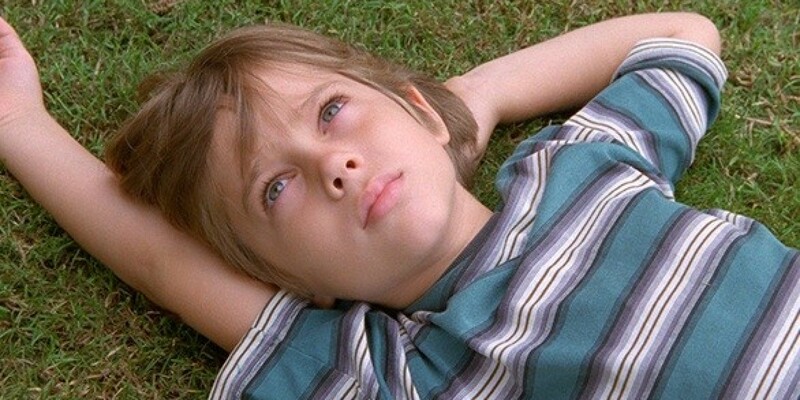 “Boyhood” is as immersive as it is observational, and at the same time inescapably self-reflective. In terms of manipulating the relationship between viewer and screen, there is nothing quite like it. But while Linklater’s novel approach to character study, a.k.a. the gimmick, should not be overstressed, it can hardly be ignored. Nor should it be. That the viewer knows what he/she knows about the making of the film—the years spent, the actual boyhood intruded upon—adds to one’s emotional investment and elation. The aspirations of an artist may not save a failed work, but when something works this well, the sense of daring behind it can be an intoxicant. Linklater has always had an appetite for the unorthodox. He rode out of Texas with “Slacker,” his unconventionally plotted—as in unplotted—indie-festival fave of 1991. The shaggy, druggy “Dazed and Confused” (1993) brought him a cult following. The animated navel-gazer “Waking Life” (2001) bestowed on him a degree of intellectual heft, and the “Before” movies of 1995-2013 (“Before Sunrise,” “Before Sunset” and “Before Midnight”) somehow made him synonymous with the realpolitik of romance, and romance itself. Meh. This reviewer prefers “School of Rock” (2003) and “Bernie” (2011), deftly hilarious and pretension-free comedies. But “Boyhood” is in some other league. Alongside a couple of his regulars (Ethan Hawke, Patricia Arquette) he cast young Coltrane, who, to Linklater’s unending good fortune, happened to progress from appealing kid to attractive man. Coltrane does not carry the movie as much as he is carried along by its story, which Linklater reportedly developed from one year of shooting to the next and which touches on aspects of contemporary life (as in 2002-13) that might, in another era, have been the basis for dramas all their own. Divorce. Marriage. Domestic abuse. Drunkeness. Unemployment. And the ever popular coming of age. Mason never “comes of age,” whatever that means. Life is a river, and “Boyhood” is merely a sizable chunk of waterfront. It is also an immigrant story, in a very particular and peculiar sense, the immigrant being Mason’s mother, Olivia (Patricia Arquette). She is a refugee in a new world, where women have not only been given rights but have also been saddled with most of the responsibilities. Olivia responds like an ambitious arriviste: She rids herself of Mason Sr., father of Mason and Samantha (played by Linklater’s daughter, Lorelei), goes to college, marries her professor, becomes a professor, makes a home, raises her kids and does it without much help from the men in her life, who are either angry or aimless. One of the more poignant moments occurs during a Houston Astros game (Roger Clemens, blast from the past, is pitching) when Mason turns to Dad and asks him if he has a job. That college professor Mom marries? Bill (Marco Perella) becomes increasingly loathsome as he descends into secret drinking and overt violence. “Boyhood” could not feel as true as it does about life among the 99 percent in the United States without being bittersweet bordering on dour. Religion plays no more part in Mason’s family life than politics. The family may live in Texas, but there is very little about them that conforms to what the rest of the country perceives Texas to be. Not only do these people lack any interest in values and virtues beyond the four walls of their home, they lack the time for devotion to them. Mason’s mother is constantly busy making ends meet or furthering her career; Dad, driving his un-dad-like GTO, is occupied with being a metaphor for the eternal rootlessness of Americans. Mom’s third husband Ted (Steven Prince), an Iraq vet who becomes a corrections officer—great choice, by the way—is symbolic of the anger and frustration evident among a certain constituency of white American males for whom the world has refused to conform to expectations. So, in a kind of sidelong way, Linklater does comment on current affairs, while keeping Mason at the center of his concerns, with a boy’s point of view informed by both the narcissism of childhood and the myopia of the eye witness. One would not trust Mason to report on the proceedings in “Boyhood,” any more than one would trust a civilian in a war zone to give an evenhanded account of the conflict. But Linklater, reporting from the front, seizes our confidence from the start. I enjoyed this review, and also the film, but I find John Anderson's closing metaphor most distressing. He wrote "One would not trust Mason to report on the proceedings in "Boyhood," any more than one would trust a civilian in a war zone to give an evenhanded account of the contlict." There is no "evenhanded account" of conflict, especially "from the front," with today's embedded journalists. Civilians, chillingly called "collateral damage" in war parlance,' are precisely the ones who give the truest account. If they survive. This article also appeared in print, under the headline "Life Itself," in the Sept. 1-8, 2014 issue. John Anderson is a film critic for The Wall Street Journal, Indiewire and Newsday and a regular contributor to the Arts & Leisure section of The New York Times.